Jamaica is an island country situated in the Caribbean Sea, consisting of the third-largest island of the Greater Antilles. The island, 10,990 square kilometres in area, lies about 145 kilometres south of Cuba, and 191 kilometres west of Hispaniola . Jamaica is the fourth-largest island country in the Caribbean, by area. Jamaica (/dʒəˈmeɪkə/) is an island country situated in the Caribbean Sea, consisting of the third-largest island of the Greater Antilles. 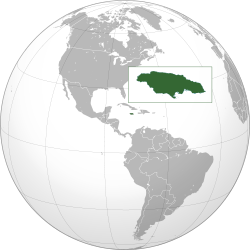 The island, 10,990 square kilometres (4,240 sq mi) in area, lies about 145 kilometres (90 mi) south of Cuba, and 191 kilometres (119 mi) west of Hispaniola (the island containing the nation-states of Haiti and the Dominican Republic). Jamaica is the fourth-largest island country in the Caribbean, by area. With 2.8 million people, Jamaica is the third-most populous Anglophone country in the Americas (after the United States and Canada), and the fourth-most populous country in the Caribbean. Kingston is the country's capital and largest city, with a population of 937,700. Jamaicans predominately have African ancestry, with significant European, Chinese, Hakka, Indian, and mixed-race minorities. Due to a high rate of emigration for work since the 1960s, Jamaica has a large diaspora around the world, particularly in Canada, the United Kingdom, and the United States.